You'll be £30.00 closer to your next £10.00 credit when you purchase The History of RAF Aerobatic Teams from 1920. What's this? Aerobatics have always played a prominent part in RAF training. They are not performed merely to provide a spectacle for the public but are an essential step in the making of a pilot, giving him confidence in himself and his aircraft. Formation aerobatics give him the added factor of confidence in his leader and other members of the team. This history of RAF aerobatic teams is the result of many years of painstaking and meticulous research from its early beginnings with five Sop with Snipes at the Hendon Pageant in 1920 to the present day 'Red Arrows'. 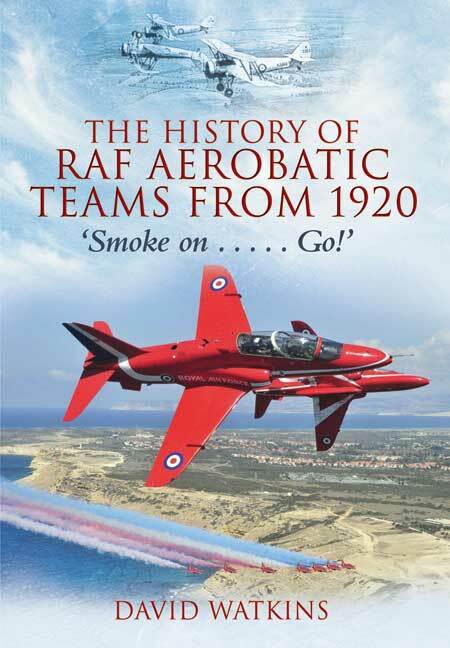 The book also contains an introduction which details the gradual development from experimental and 'stunt' flying of the early aviators, through the aerial artistry of using smoke to highlight manoeuvres and tied-together formation aerobatics, to the introduction of jet teams after the war. Also included in the book is a detailed index listing each team and its members from 1920 and it will undoubtedly provide an essential reference work on Royal Air Force formation aerobatic teams for aviation historians and enthusiasts. This book does exactly what it says in the title; it is extremely well researched and is undoubtedly the definitive work regarding the subject area. The book is well illustrated with over 300 photographs. Overall, this is a highly recommended book and one deserving a place on any aviation enthusiast's bookshelf. The title of David Watkins' book is self-explanatory. What it says is exactly what you get and the fact that it has been endorsed by Roger Topp and Peter Latham is an implicit guarantee of its worth. If further evidence of its authority is needed it is surely provided by the number of personalities who were consulted; the list of those acknowledged runs to approaching 300 names, many of whom contributed the personal vignettes which appear throughout the narrative. After brief dissertation on the overall history of the RAF aerobatic teams the book goes on to chew its way remorselessly through all of the display teams that the RAF has ever fielded. All of this and much more is recounted in satisfying detail and I will be surprised if anyone is able to come up with any significant oversights. Photographs? Oh yes! More than 300 of them, all well-reproduced; about thirty of these are in colour including, quite remarkably, one of a Fury of No 1 Sqn taken in 1934. Watkins' book, which runs to a pretty hefty 475 pages, is a tour de force but, while my admiration for it must be evident, I have to say that it is not really a book that one can settle down to read from cover to cover. As a book to dip into, it is full of informative and entertaining anecdotes and, as work of reference, it is quite unique. If you ever flew in a team, I anm 99.99% certain that you will find your name recorded here. Had I not been able to exercise my editorial prerogative to secure the review copy, I would certainly have bought one myself.